Saturday, March 31 is the world premiere of Boiled Angels: The Trial of Mike Diana, a documentary about the first artist in the United States to be convicted of obscenity. Diana was first charged with obscenity after an undercover Florida detective posed as an artist to obtain copies of Boiled Angel. In a week-long case in March of 1994, a Florida jury found Diana guilty of publishing, distributing, and advertising obscene material. They agreed that his work “lacked serious literary, artistic, political or scientific value” because it did not compare to such works as The Grapes of Wrath or Picasso’s “Guernica.” Boiled Angels: The Trial of Mike Diana was chosen to premiere at IFC’s inaugural What The Fest!? a four day film festival in Manhattan dedicated to showing a curated collection of genre films. Each selection is designed to astonish and unsettle the viewer in the theater and then delight and entertain them at special events devised to expand the viewing experience. After the film, there will be a Q&A with Mike Diana, Frank Henenlotter (director), Anthony Sneed (producer), Mike Catalano (producer, expert) with moderator Mike Gingold (film journalist, author). 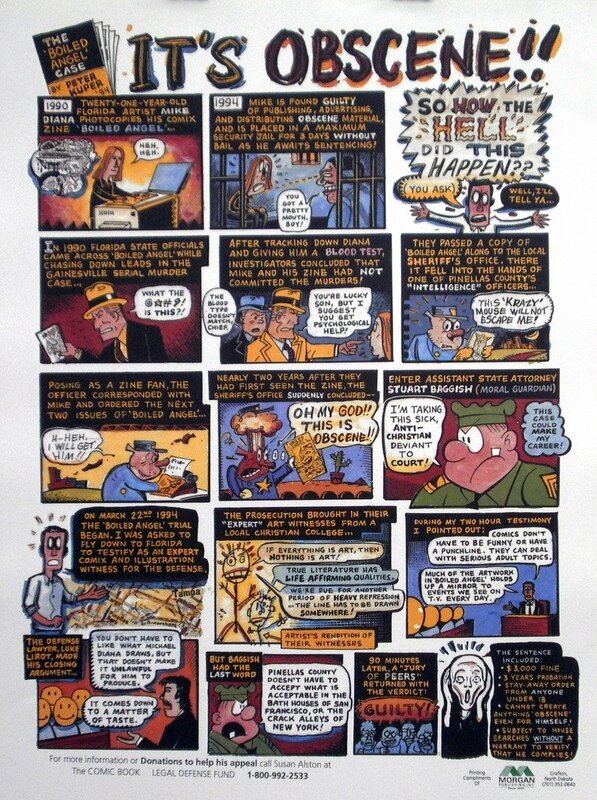 If you’re not in New York City this Saturday, check out this poster (pictured below) artist Peter Kuper did about the Mike Diana trial to benefit CBLDF and important First Amendment work, like financing the defense of artists in outrageous court cases.